I second the vet motion. Pink in discharge is not usually a good thing. If you are worried,I would take your pet to the vet. What type of substrate are you using? It looks like sawdust and wood chips. Not a good idea. 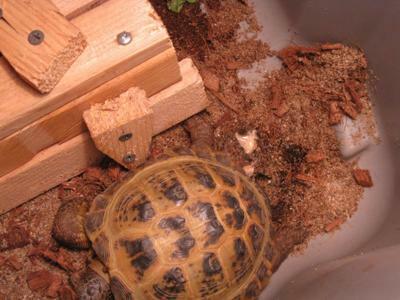 You tortoise might have ingested some of it has irritated his digestive track. The best bet is to take him to the vet. Good luck.